If you live in the state of Oklahoma and you have been considering starting college or going back to college, then there are a few programs you may want to know about. College can be very expensive. If there weren’t any programs, scholarships, or grants available to help fund school, so many people would not be able to afford to go to college. Fortunately, there are many programs and opportunities out there to help fund a college education. It’s helpful to know where to look. These programs can vary from state to state. That’s why it’s crucial to find out what opportunities await you in your state of residence. The state of Oklahoma has many such opportunities available. Let’s go over some of them. This is a college grant that is awarded each year to low income level individuals that are attending a vocational, public, or private school located in the state of Oklahoma. It totals to a yearly sum of $1,300. The OTAG is a need-based type of grant, and it is awarded to full-time and undergraduate college students. This grant has many applicants, and for your best chance at consideration for this grant, you should apply very early for it, and the earlier, the better. Anytime after January 1st is ideal. Here is the link to apply: www.fafsa.gov. If you are an undocumented immigrant, you will need to apply with a special form. This is a college grant meant for the financially disadvantaged who are interested in attending a private institution of higher learning but lack the means to fund it. Candidates that meet the criteria for funding can receive up to $2,000 annually for their private education. There are only certain colleges in the state of Oklahoma that accept the OTEG award. 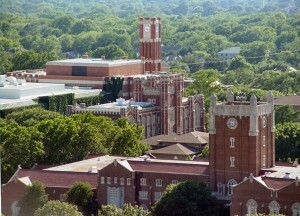 Those colleges are as follows: The University of Tulsa, Bacone College, St. Gregory’s University, Family of Faith College, Southwestern Christian University, Hillsdale Free Will Baptist College, Southern Nazarene University, Mid-America Christian University, Oral Roberts University, Oklahoma Baptist University, Oklahoma Wesleyan University, Oklahoma Christian University, and the Oklahoma City University. For further information on the Oklahoma Equalization Grant contact Oklahoma Tuition Equalization Grant Program hotline Toll-free: (800) 858-1840. This is a program that middle school students as young as eighth graders can sign up to be a part of. The qualifications of this program are rather specific in nature. Students must sign up for and participate in the program anywhere from the eighth grade up through the tenth grade. The income qualifications are specific as well. The family income of the applicant must not exceed $50,000 a year when enrolling, and be under $100,000 a year once attending college. There are milestones to be met and a grade point average that must be kept up, but the outcome for participating in the program is fully paid in-state tuition. The other qualification for being eligible for this program is that to receive paid tuition, the student must be enrolled in college on a full-time basis. If you are a homeschooled or if you attend a non-accredited high school, be 13, 14, or 15 years of age, then you must take a national ACT test and receive a score of 22 or higher to be eligible. To apply for this program, go to okcollegestart.org. Students in the state of Oklahoma can receive money for college in the amount up to $5,500 in the Academic Scholars Program. This is a very helpful program that can help to pay any and all of the fees associated with college life. These fees can include but are not limited to room and board, tuition, books, transportation, and many other related costs. There are some qualifications that must be met to qualify for this program. The student must exhibit outstanding scholarship by having been awarded the title of National Merit Scholar, US Presidential Scholar, or a National Merit Finalist. Qualification for this program can also be achieved by students who score in the 99.5 percentile on their SAT or ACT test. They can also be directly nominated by the college that they choose or that chooses them. When attending a public college or institution you can also receive a waiver for tuition. Students who want to qualify for this merit award must attend college the first fall semester following their high school graduation. Students who have taken their SAT or ACT and qualify for this award based on their score can apply for this award through their high school counselor or by filling out the application from www.okhighered.org. You can also obtain the necessary form through the State Regents Office at 1-(800) 858-1840 or 225-9239 in Oklahoma City. Contact the institution you wish to attend if you qualify for this program as a National Merit Scholar, US Presidential Scholar, or National Merit Finalist. Students who have received a score of 30 or more on their ACT test or have held the position of National Merit Scholar or Commended Student may qualify for a tuition waver and up to $3,000 in available funds for help with college. This program is available for use to qualifying students for up to 8 semesters or up until a baccalaureate degree is obtained by said student. This award of merit is only usable at the university it is offered at. It cannot be used or transferred to any other in-state university. The following in-state universities offer this program: University of Science and Arts of Oklahoma, Cameron University, University of Central Oklahoma, East Central University, Southwestern Oklahoma State University, Langston University, Southeastern Oklahoma State University, Northeastern State University, Rogers State University, Northwestern Oklahoma State University, and Oklahoma Panhandle State University. Students should contact one of the universities listed above that they are interested in attending to find out the deadline for applying for this merit award. This is a scholarship that provides between $3,500 and $5,500 to the dependent children that were affected by the 1995 bombing of the Alfred P. Murrah federal building in Oklahoma City. The student needing to qualify must be a dependent of a deceased person who died in the bombing or one of the children injured in the daycare at the bombing site. This scholarship can help to provide money for all aspects of college expenses. If you qualify and would like to apply for this scholarship fund, send an inquiring email to studentinfo@osrhe.edu or call the Oklahoma State Regents for Higher Education at 1-(800) 858-1840. To be eligible for this yearly renewable $1,500 scholarship program, a student has to have scored a 32 or above on their ACT or at least a 2130 on their SAT. While this scholarship is mostly merit-based, the committee that reviews the eligibility for this program also looks at other aspects of a student’s life such as community outreach and involvement, extracurricular activity, academics, and leadership qualities as well. Students that are interested in finding out if they qualify for this scholarship program should obtain an application from their high school counselor. If you are a full-time resident of Oklahoma and are an active member of the National Guard, you can receive full tuition to an Oklahoma college. You cannot already hold a baccalaureate degree. You must meet all the admission requirements of the Oklahoma University you are planning on attending. You must be in good standing with the Oklahoma National Guard and have this certified by your adjunct general. You must be a member of the National Guard when starting your first college semester. You must have already graduated high school. You must be planning to receive either an associate or baccalaureate degree. You must attend at least 6 hours per semester. The Oklahoma National Guard must receive a plan on your full college intent. This is a scholarship designed to help those who are intent on attending college and need a helping hand. Anyone can apply for this scholarship fund as long as they are planning on attending a college or university that is supported within the state of Oklahoma. They must also have graduated from an accredited high school or equivalent program. They also are not eligible if they are related to anyone on the May T. Henry Scholarship Foundation selection committee. This is a scholarship that is available for those interested and already working within the childcare field. These programs offer stipends and scholarships for those within this field of study and those who are already working in the field and want to further their education and obtain an associate’s degree in either child development or early childhood education. The degrees they may obtain through this program are the (CDA) Child Development Associate degree, or the (CCP) Certified Childcare Professional degree. To qualify for this program, applicants must work at a one-star or more childcare facility, or work at an OKDHS or tribal licensed child care facility that is populated with at least 10 percent subsidized children that are under school age. You must have been employed at said facility for 3 or more months and taken the (ELCCT) Entry Level Child Care Training. Your pay must not exceed an amount of $15.50 per hour. You must be employed in said facility as a teacher, provider, or director to qualify. This scholarship program is open to residents of Oklahoma who are earning their degree as long as they are attending a two- or four-year university. There are other qualifications that must be met according to the particular university the applicant is applying to. Interested individuals should check with the qualifications according to the university that they are interested in attending. This is a specialized education scholarship available to those students who maintain a 3.0 GPA and have been residents of Oklahoma for 5 consecutive years prior to applying for this specialized scholarship in chiropractic study. They may obtain a scholarship to an out-of-state chiropractic school that they are accepted to and must maintain their 3.0 GPA throughout their education progress. To apply for this program, contact the Chiropractic Education Assistance Scholarship program at the Oklahoma Regents for Higher Education, or call (800)-858-1840 or 225-9239 in Oklahoma City or e-mail studentinfo@osrhe.edu. This is a specialized education program designed to entice students who are interested in becoming future educators in the state of Oklahoma. Due to the critical shortage of educators within the state, especially in public schools, this renewable scholarship was made available to make it easier to pursue an education degree in the state of Oklahoma. Interested students who would like to pursue this scholarship must have a GPA that falls within the top 15 percent from their graduating class. Their ACT or SAT must have fallen within that same 15 percent ranking. They must be admitted into an education degree program at an Oklahoma higher education facility that is nationally accredited. Full- or part-time students are qualified to apply for this scholarship program. There is help out there to pay for your college education in Oklahoma. It only takes a little time and know-how to find out all the programs that are out there and available to apply for. Hi i want to return to college and need help with information on all and any college grants in tulsa Oklahoma. I have around 50plus college hours from Texas but have been out of college for the past 10yrs.